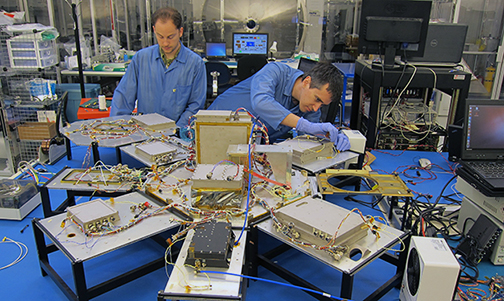 Smallsat missions developed and launched by Space Flight Laboratory (SFL) have achieved 100 cumulative years of on-orbit operations. Over the past two decades, SFL has developed 25 smallsats that have been launched for space science, Earth Observation (EO), communication, radio frequency geolocation, environmental monitoring, technology demonstration, and ship detection. SFL was established in 1998 as a self-sustaining specialty lab at the University of Toronto Institute for Aerospace Studies (UTIAS) to provide end-to-end microspace services on tight schedules and at low cost to deliver significant returns for clients around the world. These technological breakthroughs include advanced control for formation flying and precise pointing and tracking, modular power systems for a range of spacecraft sizes, and propulsion systems tailored to sub-100 kg. platforms. HawkEye 360 Pathfinder constellation, three formation-flying smallsats built by SFL under contract to Deep Space Industries for HawkEye 360 Inc. Launched in December 2018 and commissioned in early 2019, the constellation is offering commercial space-based radio frequency (RF) detection and geolocation services. NorSat-1 and -2 smallsats developed under contract with the Norwegian Space Agency (NoSA) and launched in 2017, have achieved significant improvements in maritime ship monitoring and important international scientific objectives, resulting in SFL being awarded the development contract for NorSat-3 in 2018. GHGSat-D smallsat launched in 2016 by GHGSat Inc. to demonstrate that point sources of greenhouse gas emissions on Earth could be detected from orbit, leading to SFL being contracted to develop GHGSat-C1 and -C2 for commercial operations. Including NorSat-3 and the two GHGSat microsatellites, SFL currently has 12 satellites under development at its facility in Toronto. Among these, SFL is developing an aerosol and greenhouse gas monitoring microsatellite, DMSat-1, for the Mohammed Bin Rashid Space Centre (MBRSC) in Dubai. Additionally, SFL has completed Slovenia’s first Earth observation satellite, NEMO-HD, for capture of high-definition video and imagery, which will be launched later this year. SFL Director Dr. Robert Zee said the company was established with the goal of creating breakthrough technologies that enable smaller satellites to cost-effectively perform complex missions once believed only possible with expensive larger satellites. SFL is proud to be a world leader in developing microspace technologies that open the door for nanosatellites and microsatellites to perform cutting-edge commercial applications. Such applications would otherwise be forestalled or precluded by the expense of traditional satellite approaches.